Vinyl Deck Material – The Perfect Choice? Vinyl deck material is the perfect choice for homeowners planning to build a new deck. Durable and easy to maintain, vinyl decking is worth the investment, and will make a great addition to your house. Until recently, American homeowners only had the choice of hardwood decking. But, in the last 10 years, vinyl decking has become one of the most popular choices for new deck construction in the US. Why Choose Vinyl Deck Material? Here are just a few of the best reasons why homeowners are making the switch to vinyl decking. When exposed to extreme heat and cold for many years, wood has the tendency to crack, split and even rot. Vinyl decking, on the other hand, is made from highly durable synthetic materials proven to withstand exposure to extreme heat and cold. These decks do not crack or deform. Wood decking is subject to damage caused by fungi rot. Fungi spores need moisture and it’s no secret that wood retains moisture. Eventually, fungus growth will cause the wood to rot. 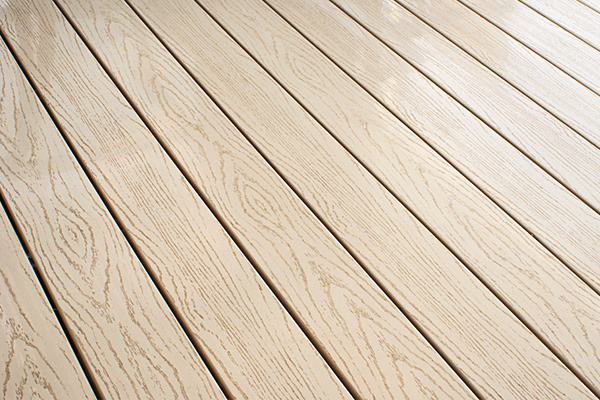 With vinyl decking, there is no need to worry about rotting. Vinyl decking is completely synthetic. No fungi will thrive on it. Vinyl decking materials at purchase may be a bit higher than wood. However, over the course of many years, the dividends of investing in vinyl pay off. And there are virtually no maintenance costs associated with vinyl deck materials. Wood, on the other hand, rquires annual maintenance. Whether it’s cleaning, sealing staining or repairs due to rotting, wood decks will be more costly over time. Visit our showroom at Country Estate Fence and learn why vinyl deck material is becoming a popular choice for homeowners. Vinyl is versatile, durable, economical, and virtually maintenance free. Whether you are looking for the mainenance-free features of vinyl, or long-term durability, there is a vinyl decking solution for you. With many styles of PVC vinyl decking options, see us for custom designs as well. Get a custom look with our Embossed (wood grain effect) and streaked profiles. Find out why Country Estate Products is the vinyl deck supplier in Marietta GA to call first.